A moment of beautiful – crocuses in bloom! A couple of days ago, as I left the driveway, I looked back and saw my blooming crocuses … purple and dark-purple-veined … shining in the sun. The sight reminds me to always plan for the future. I planted these a few years ago, thinking, one day these will give me and others lots of joy. Today was the pay-out! It won’t be long and we will be plagued by mosquitos and blackflies here in New Brunswick. On the planet Meniscus, the setting for my sci-fi series, there are no mosquitos and no blackflies. Life there is hard enough! However, I have populated the Meniscus woodlands with elginards. These are small wingless insects that drift on the breezes. As the book says, they are “… purposeless, ephemeral …”. The inspiration for these creatures is the wooly aphid. In the late autumn days in New Brunswick, wooly aphids float like flakes of snow on the air. Elginards also remind me of dandelion fluff. The elginard in my book is a symbol for a purposeless life, lived at the whim of circumstance. On a drive along the Saint John River south of Oromocto, we were happy to get great views of two Bald Eagles. Spring is here and berry-picking season won’t be far behind. First will be wild strawberries, then raspberries, blueberries and blackberries. The perfect time for poems about berry picking, gardening and foraging … all in my book of poetry ‘within easy reach’ (Chapel Street Editions, 2016). I will be out reading from my book three times during the month of April. It’s National Poetry Month and many libraries and bookstores will be featuring reading events. 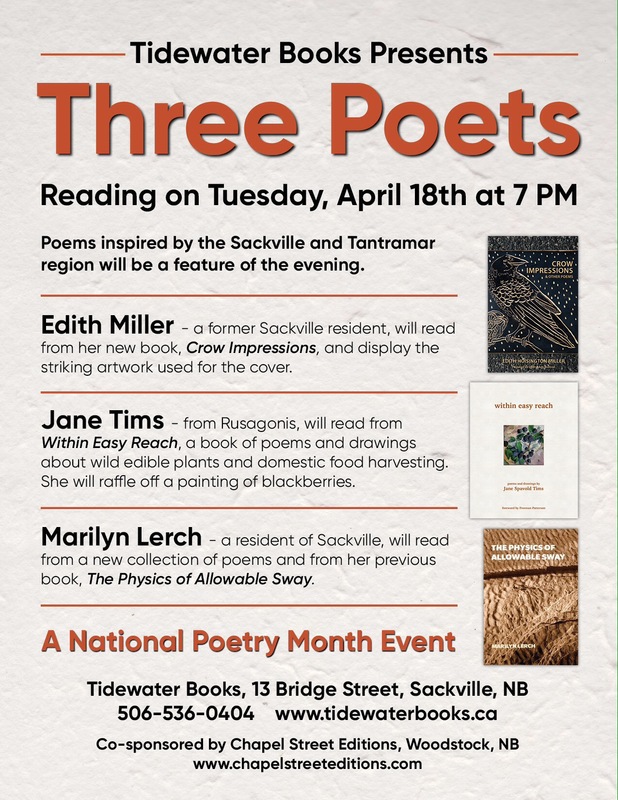 As you can see, the Sackville reading will include two other poets whom I admire, Edith Miller and Marilyn Lerch! If you live near one of these venues, I would love to see you! Looking forward to those wild strawberries! Winner … what is ‘beelwort’? I am happy to announce the winner of my contest ‘What is beelwort?’ Beelwort is a mysterious item mentioned in the first book of my Meniscus sci-fi series — Meniscus: Crossing The Churn. My books give only small hints about the nature of beelwort: it get slipped into pockets as a joke and, although edible, is not very palatable. The winner of the contest is Allan Hudson. Allan is the editor of the South Branch Scribbler, an on-line blog exploring the arts. Every week Allan posts an article, guest blog or question and answer session about an author, musician or artist. Have a look at http://allanhudson.blogspot.ca/ The blog includes some interesting insights into the process of writing and the methods of some well-known authors. Allan’s answer to the contest defined beelwort as ‘… an edible, hallucinogenic fungus only found on Meniscus …’ To this, I will only add ‘rather squishy’. Beelwort will finally be defined, using Allan’s definition, in Book Five of the Meniscus series — Meniscus: Karst Topography. Also, Allan will receive a postage-paid copy of my first poetry book within easy reach, poems about eating wild edible plants (available at http://www.chapelstreeteditions.com or on Amazon). Meniscus: Karst Topography (I took geology as a minor in university) is in draft form at present. However, the first book in the series — Meniscus: Crossing The Churn — is now available at Amazon in paperback and Kindle formats. Meniscus: Crossing The Churn is a science-fiction adventure/romance describing the meeting of Odymn and the Slain. Written as a long poem, it is a book about loss, freedom and relationship. The remaining books in the series will bring new characters into the mix and tell a story about building companionship, family and community on a dystrophic planet where even casual contact between humans is discouraged. Don’t let the poetry format put you off! The tale is told in short lines, written as concisely as is possible to tell a story! Thank you to Allan for entering the contest! Your book within easy reach is in the mail! Belnar, one of the characters from Book Two is into the honey mead, but he could be eating beelwort! We have waited eagerly for spring here in New Brunswick. With late snow storms and temperatures still in the minus degrees Centigrade, my day lilies are just peeking through the grass at the edge of the snow. Every year, my husband and I watch for our own harbinger of spring …. the return of the Canada geese to the river. We went for a drive last week to find many examples of geese feeding in the bare fields and along the river edges.